I don't know what all my readers were doing last week that nobody wrote me to tell me about this article in the Times about marriage between first cousins. Oh, right...Thanksgiving. The weird part is that they've hidden the piece in the "Home and Garden" section, of all places. 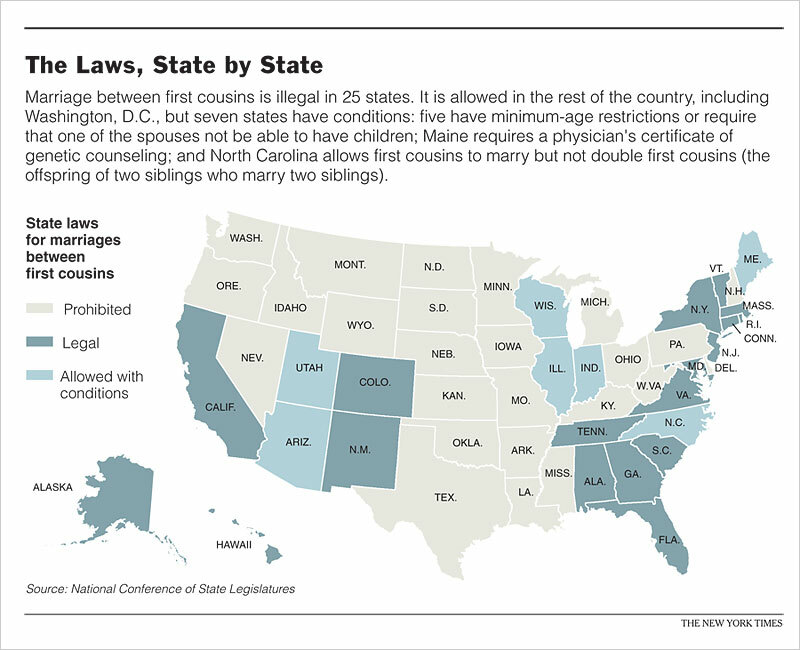 The article tells the stories of two couples where the spouses are first cousins, and their families' reactions to their relationships. One said her mother said it would have been easier to tell people her daughter was a lesbian. 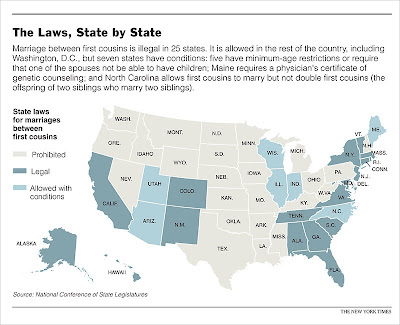 I wonder how, in a nation where families may not live in the same town much less state, anyone would even know that two people filing for a marriage license are cousins. Many cousins may not sure last names and, if the two don't disclose, how would the authorities know they were related? I have probably 30 first cousins and I think only 3 or 4 of them have my last name and not one of them lives in my state. For those cousin couples who do get married, the website cousincouples.com allows them to come out of the closet and find community with other couples. And those pesky genetic problems? Probably not a big deal, say various scientists in the article. Defects are more likely to occur in couples whose families have a long history of intermarriage--in a couple who are the first set of cousins to have children, gene problems are unlikely. The website is interesting--it has a list of famous people who married their cousins (Jerry Lee Lewis, natch) and an analysis of what Christianity has to say on the matter.